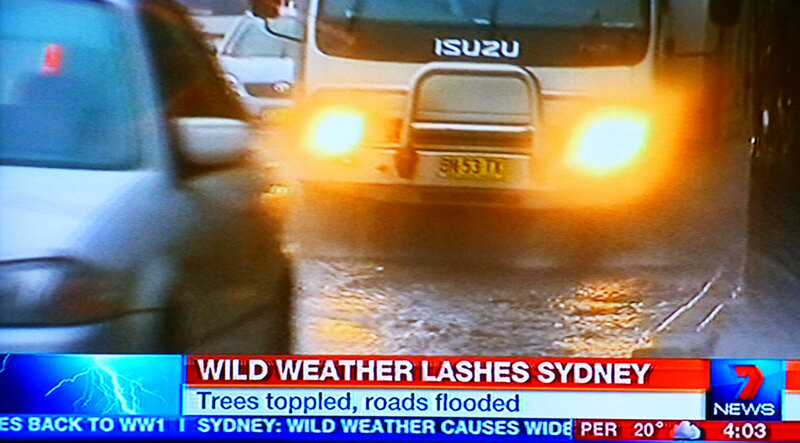 The final leg of our Australian adventure landed us in the middle of Sydney’s rainiest August in over a century. The first day was mostly lost to the rain and wind, but after a 3 a.m. wake-up call for our flight out of Melbourne, the day of rest was welcome. We watched storm coverage on the news, napped and dodged the drops to get over to the nearby food court. Luckily, the weather broke long enough over the next couple days that we were able to get out and see Sydney’s central business district (CBD). 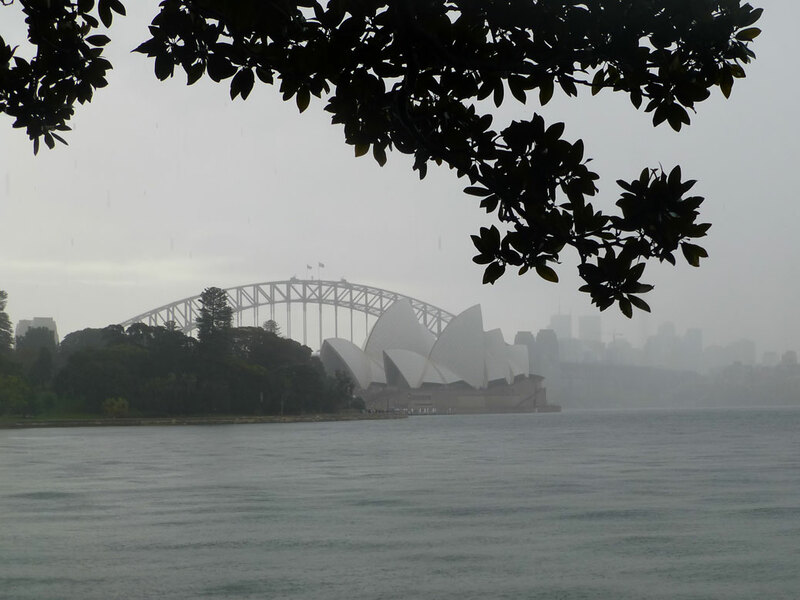 Rain or no rain, we didn’t come all the way to Sydney to NOT see the Sydney Opera House. Named a UNESCO World Heritage Site in 2007, it’s easily one of the most recognizable structures in the world. The architecture is breathtaking from up close as are the details you can’t see in pictures. 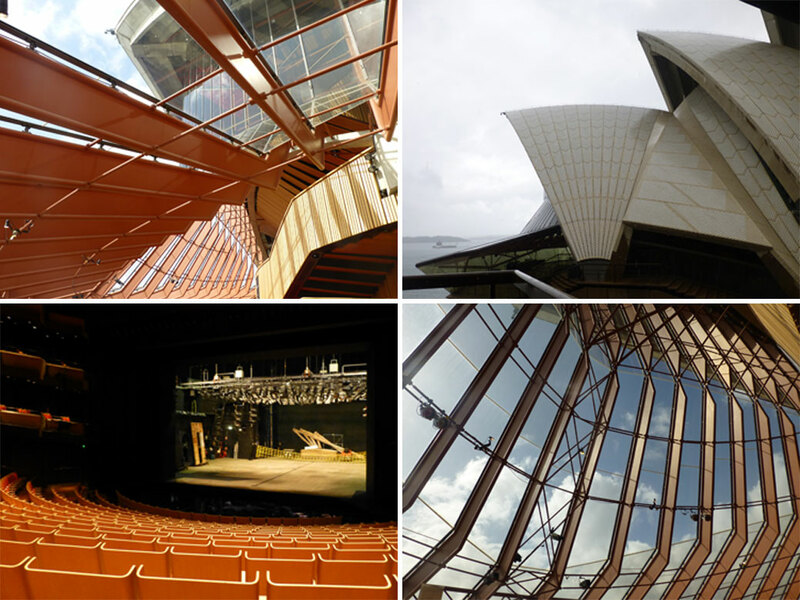 We took a tour of the Opera House, which I’d highly recommend for visitors to Sydney. The story of the Opera House and how it came to be is fascinating. More than 230 design proposals were submitted for the building, but the chosen design by Danish architect Jørn Utzon was pulled from the pile of previously-rejected designs. 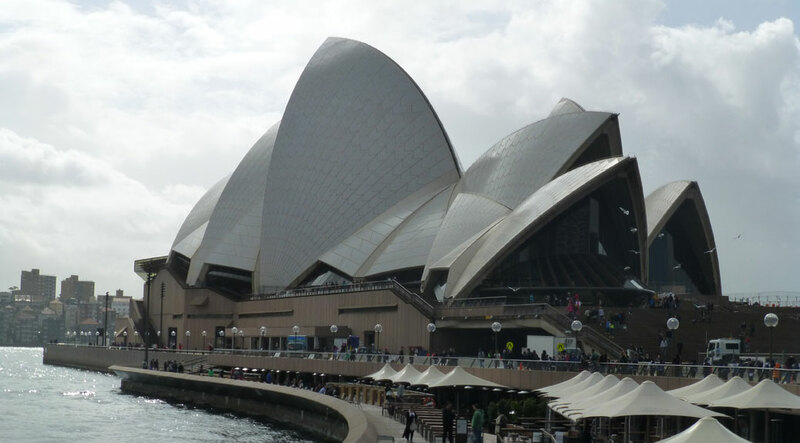 The plans were roughly sketched and, even after construction began, nobody was quite sure how the sails of the Opera House would be constructed. The final product was $95 million over budget and 10 years behind schedule. With all the deserved fame from the architecture, it’s easy to forget this is a functional performance venue. There are six different theaters and studios hosting both musical and theatrical performances multiple times a day. Construction improvements are actively underway at the 40-year-old venue to better meld the Opera House’s multiple masters of performance and tourism. 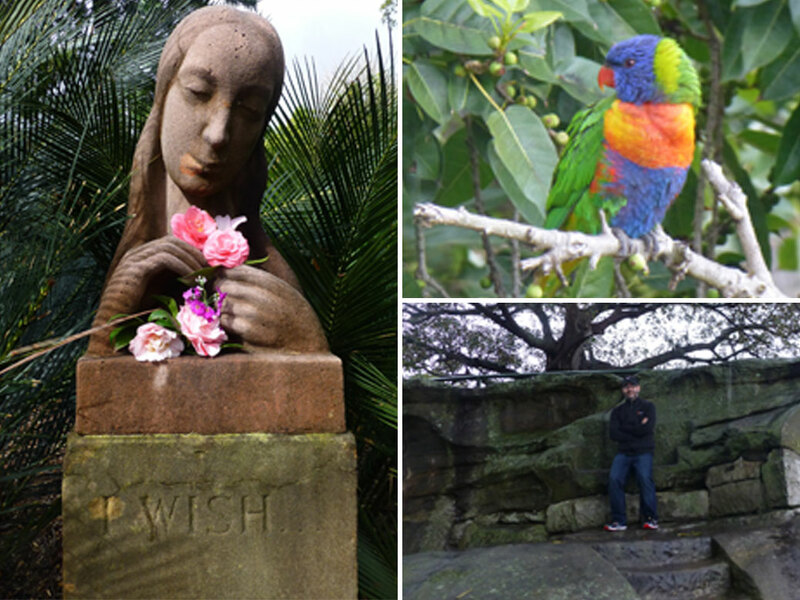 The Sydney Royal Botanical Gardens are a short walk from the harbor. The Government House offers a grand entrance to the gardens. Since 1996, the house has been open for public tours on weekends, but since we were there in the middle of the week, we missed out on the formal tour. 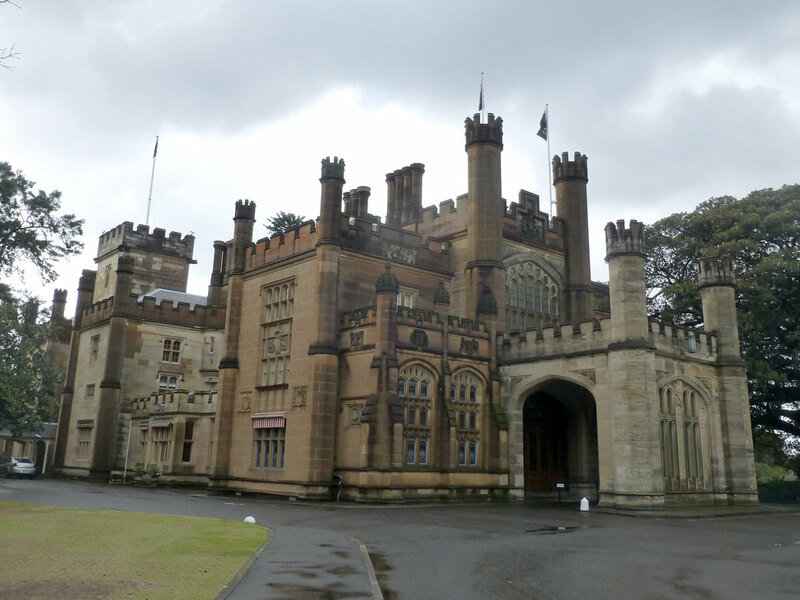 It also serves as the official home of the Governor of New South Wales and, when visiting, Queen Elizabeth herself. The gardens themselves cover nearly 75 acres. Paths criss-cross every which way and lead to different local flora and fauna. The park wraps around Farm Cove, a small bay off Sydney Harbor and the landing spot for Queen Elizabeth’s first visit to Australia in 1954, the first time a reigning monarch had come to the continent. Fresh flowers were placed in the hands of the “I Wish” statue, mounted in 1946 at the site of the first Wishing Tree. A rainbow lorikeet failed greatly at its attempts to blend in to the background. I hovered over Mrs. Macquarie’s rain-soaked chair, a bench carved into the sandstone by convicts in 1810 for Governor Macquarie’s wife Elizabeth who enjoyed watching the ships sailing into the harbor. The rain found us again while we walked the gardens and we spent a good 20 minutes under a large tree waiting out the storm. But with a view of the Opera House and the Sydney Harbor Bridge over Farm Cove, it wasn’t much of a hardship. 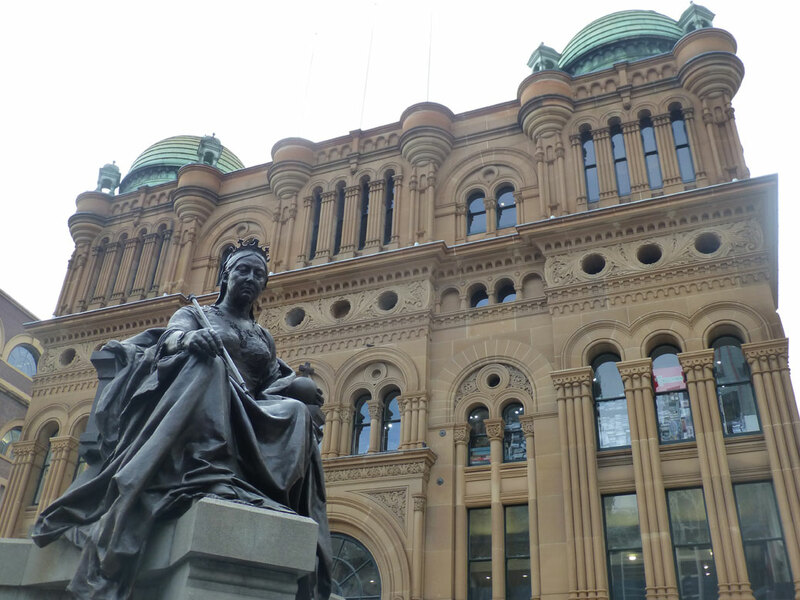 While Australia’s largest city is a major and modern metropolis, its colonial history dates back to 1788. 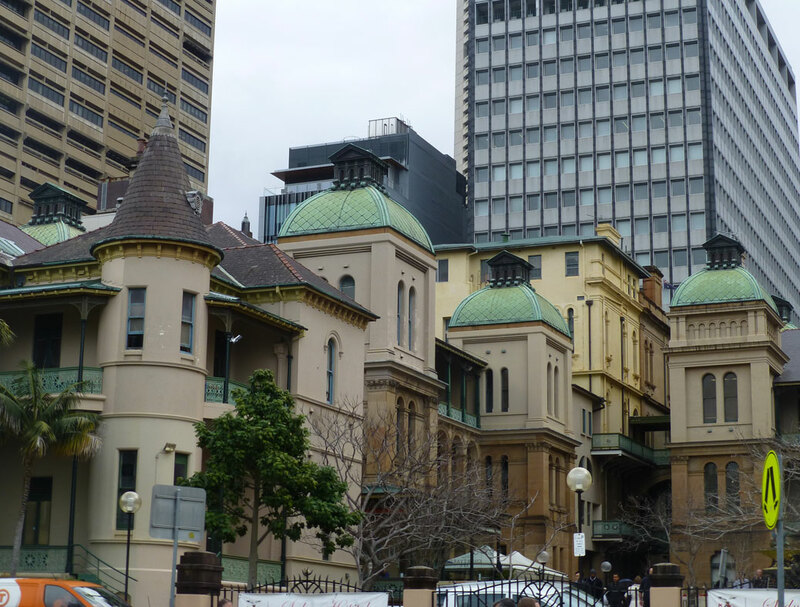 Buildings, like the Sydney Hospital are more than two centuries old and clash with the glass and steel backdrop of downtown Sydney. Some of Sydney’s first European settlement has been preserved on the harbor’s south shore in an area known as The Rocks. While it’s mostly a tourist destination now, it has the degenerate past of many a port town. Still, buildings dating back to the 18th and 19th centuries stand today. Five cannons are mounted at the ready under the Sydney Harbor Bridge at the Dawes Point Battery. The defense post was built shortly after the settlement of the area to protect the area from incoming fleets, including an American ship in 1798 and Russian fleets in 1850 during the Crimean War. 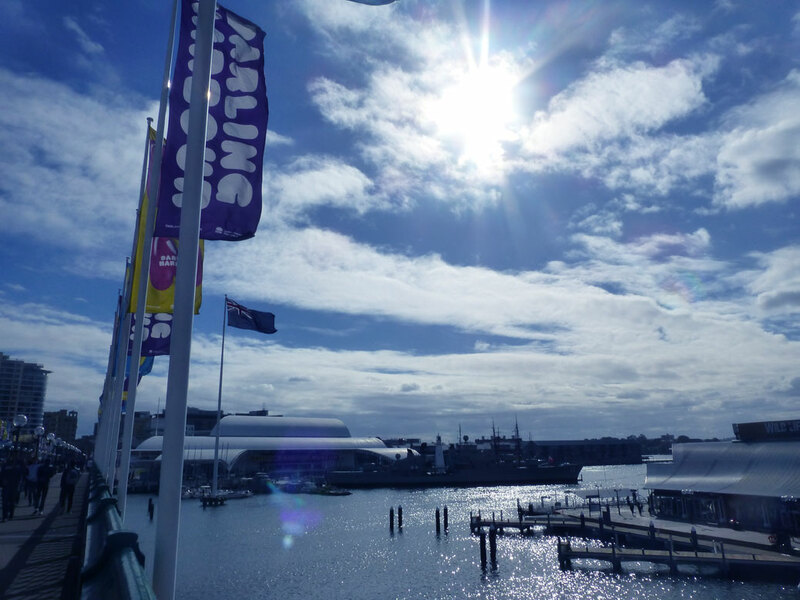 A view of Darling Harbor and some blue sky! 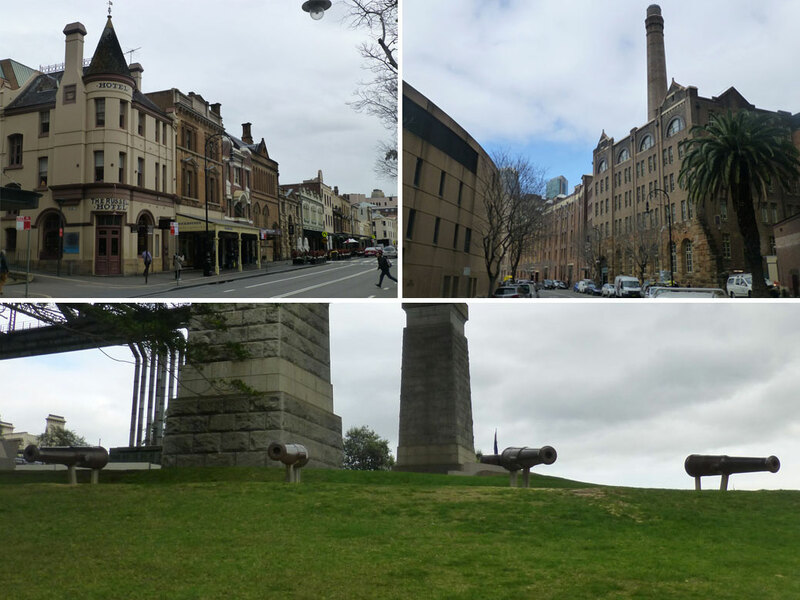 On our last day in Sydney, we wandered more of the CBD. We crossed the bridge at Darling Harbor, an in-development entertainment district that also housed the residents of MTV’s The Real World: Sydney. I’m sure they’ve scrubbed thoroughly since the MTVers left town. 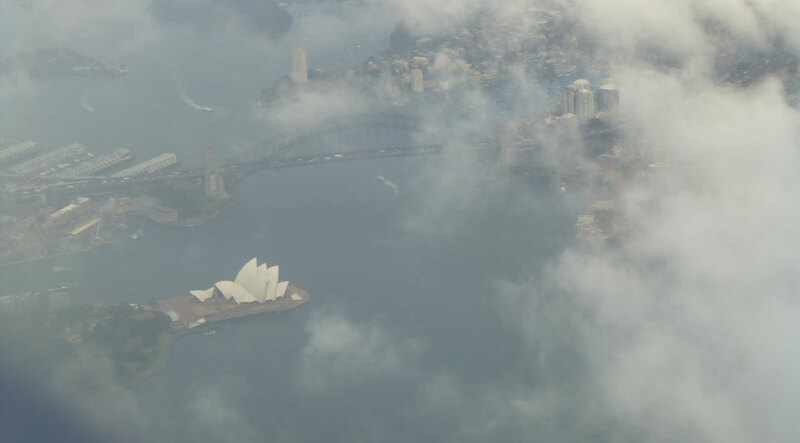 Sydney felt like a whirlwind, and probably still would have even had we not lost a day to the weather. There are several districts, each with their own unique personality and we only managed to sneak in part of one of those before our time was up. And, with that, our Australian adventure was over. 17 days, four amazing Australian cities, five flights and a lifetime of memories. Looks like you had a great time. Thanks for keeping us all updated on your adventures. Wondered if you are affected by the volcanic eruption in Japan? It was an amazing trip! No impact from the eruption in our area. It’s a little over 100 miles as the crow flies from where we live. I thought I smelled some smoke in the air the day it happened, but there’s also been some field burning going on, so it’s hard to say. The ash only fell a few kilometers around the mountain.